In the pressure sensing industry, there are many different sensor technologies, but all sensors can be broken down into two classifications: oil filled, non-oil filled. An oil filled sensor refers to a sensor that uses oil as a transfer medium between a diaphragm and the sensing element, typically a MEMS based electronic sensor. Oil filled sensors appeal to many manufacturing applications due to its material compatibility, low cost, and ease of implementation into a completed sensor design. Although these sensors are becoming more common, there are several drawbacks to selecting an oil-filled sensor over a non-oil filled sensor. The biggest drawback of an oil filled design is the high cost of failure. If the sensing diaphragm ruptures due to overpressure or manufacturing defect, oil can leak into the application and contaminate the system. If the oil gets into the system, it can damage the critical components costing thousands, if not millions of dollars depending on the application (i.e. fuel cells). Unfortunately, there is no fix for many systems once they are contaminated by oil. Non-oil filled designs eliminate the possibility of contamination due to failure and can withstand higher overpressure spikes. When selecting a pressure transducer, the length of time a transducer will last in the application is a critical concern. Selecting a transducer with an all-welded construction enables a robust design that will provide a long lifespan in difficult applications. Also, consider the robustness of the connectors welded on the housing. In the field these units are often exposed to less than ideal circumstances that can compromise the operation of the transducer. Be sure the manufacturer offers a wide selection of pressure fittings, including standards like 1/4" and 1/8" NPT as well as the capability to provide custom process fittings when needed. 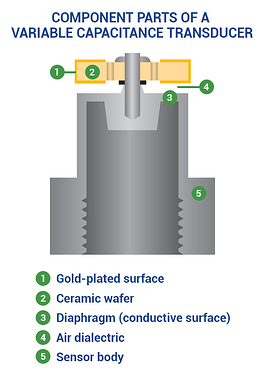 Some transducers need to be protected from humidity to prevent corrosion around the pins in the connector while more robust transducer designs can be subjected to humid environments. If protecting the transducer from a harsh environment is a concern, find one with an ingress protection (IP) rating that satisfies the needs of the installation. Transducers are available in a wide variety of ratings. A transducer with a rating of IP65 provides complete protection from infiltration of dust and the projection of water from a nozzle. 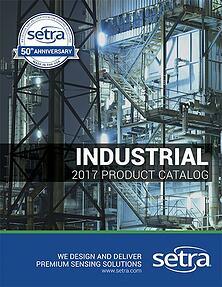 SETRA BLOG: What is the difference between NEMA and IP ratings? A transducer with an IP67 rating is protected against dust and the effects of temporary immersion of water. An IP69K rating is for high pressure, high temperature applications. If liquid ingress is a risk, sealed cables are a must. When possible, avoid oil-filled transducers because it adds an additional material with a different thermal coefficient that could add to the transducer instability. A robust circuit design can mean different things to different people, but in general the most important factors are reliability, stability and protection from extreme environmental conditions. Today, sputtered thin film and variable capacitive technologies are considered state of the art for industrial applications. 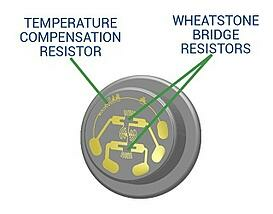 Thin film sensors employ the well-proven Wheatstone bridge principle. In this design, molecular layers are sputtered onto a 17-4 or 316L stainless steel diaphragm, and the circuit is etched to provide excellent resistor definition and uniformity. Sputtered thin film technology allows the design of simple, highly accurate and compact strain gauges to be deposited onto the back of the sensing diaphragm. Setra’s capacitive pressure transducers are expertly de­signed adaptations of a simple, durable and fundamen­tally stable device: the electrical capacitor. In a typical Setra configuration, a compact housing contains two closely spaced, parallel, electrically isolated metallic sur­faces, one of which is essentially a diaphragm capable of slight flexing under pressure. These firmly secured surfaces (or plates) are mount­ed so that a slight mechanical flexing of the assembly, caused by a minute change in applied pressure, alters the gap between them (creating, in effect, a variable ca­pacitor). The resulting change in capacitance is detected by a sensitive linear comparator circuit (employing pro­prietary custom designed ASICs), which amplifies and outputs a proportional, high level signal. SETRA BLOG: What is capacitance? Both measuring principles virtually eliminate drift, while offering enhanced sensitivity. These technologies incorporate a compact design with good temperature stability. Both thin film and capacitive based sensors provide an analog output that is both linear and proportional to a pressure input with high accuracy and performance. One last piece of advice: select a supplier that offers more than one technology. Each application has different design considerations which may dictate the used of one technology over another. For example, for lower pressure ranges and high overpressure applications, capacitance is the idea choice. However, for higher pressure and higher vibration applications, a design engineer may lean towards a thin film style sensor.